Facebook which is one of the leading social media chat has just announced to the public that they will be introducing a new update on their Social networking app for iOS app. Apart from the announcement made to the public, Facebook also released a better and detailed changelog which comes in hand with all the improvements and features that will be added to the upcoming new update they thought of. Having this new update that is rolled out, Users will be able to make a purchase via the app and as well take actions whenever they find a place they want to go to. For example, this is the way it works, if you wanna order food on Facebook, you can do that directly from restaurants Facebook page. 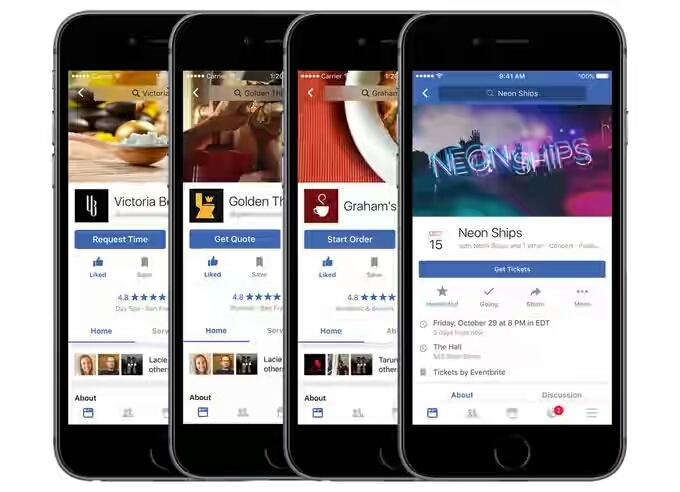 So, in essence, there is now a new "start order" tab presently on any restaurants Facebook Page which uses delivery.com or slice that anyone can click on to get food ordered faster to them. √ Guide On How To Share Applications On Apk/Zip/Pdf Files Through Whatsapp Chat App To Anyone. Another new interesting update made for users, is the option that gives them the opportunity to get ticket to any event or movies. So it means that, users can directly buy ticket through dedicated Facebook pages through Fandango. As it stands now, the new feature has been implemented in partnership with Ticketmaster and Eventbrite. So users can now get ticket to other events directly from the event pages on Facebook social network. The newly introduced update allows users to request for an Appointment from a salon, spa or other local businesses. In other words, one can be able to view the whole range of services and also make a request through the Facebook page for business deals. The appointment confirmation will get to you through messenger. Another feature which is about the new recommendation system, with it, you now turn on the recommendation option for any of your update or post in which you need advice on services or places for. So with that, your friends will be able to write/post suggestions in form of comments concerning the post you posted and it will be visible on your map. From the office of Facebook officials, this new features will only be rolled to the United States in a couple of days. And many more features will be added to the present existing ones soon. So stay tuned!